As of this writing, the Eagles haven’t made any FA news, so I’ll continue with our draft talk. Today we will look at the 2010 NFL Draft (B-Graham year). For those of you who noticed, I’ve skipped 2011 for two reasons: 2010 is more interesting, and I can only find 1 set of prospect ratings for 2011. I haven’t really emphasized this yet, but a MAJOR part of the PVM ranking system is the consensus prospect ratings. The average rating is far more important than the PVM adjustment. As a result, if I have only one set of ratings the rankings will not be nearly as valuable. To that end, if any of you know where I can find 2011 prospect grades/ratings (numerical), please either email me, tweet me, or respond via comments. I still hope to find another set to work with (right now I only have ESPN’s). In the meantime, here are the top 32 prospects for 2010 via the PVM system. For these, I used ESPN and NFL.com ratings, though the NFL.com ratings had to be adjusted to a 100 points scale. Remember, the right-most column is the player’s actual draft pick minus his PVM Rank. So players with a negative number were drafted HIGHER than their PVM Ranking. Only players chosen in the top 2 rounds are included in the analysis. – Jimmy Clausen shoots WAY up the board. While the PVM adjustment helped, this is mainly due to the fact that his average rating was 92.27. – CJ Spiller jumps into the top 5. – Brandon Graham, regardless of the trade involved, appears to have been taken right where he should have. However, both JPP and Derrick Morgan rank higher and were on the board when the Eagles picked. To be fair, all three players were taken by the 16th pick (Eagles originally has the 24th), so had the team not traded up there was a strong chance they would not have been able to choose any of them. Really like this one for obvious reasons. 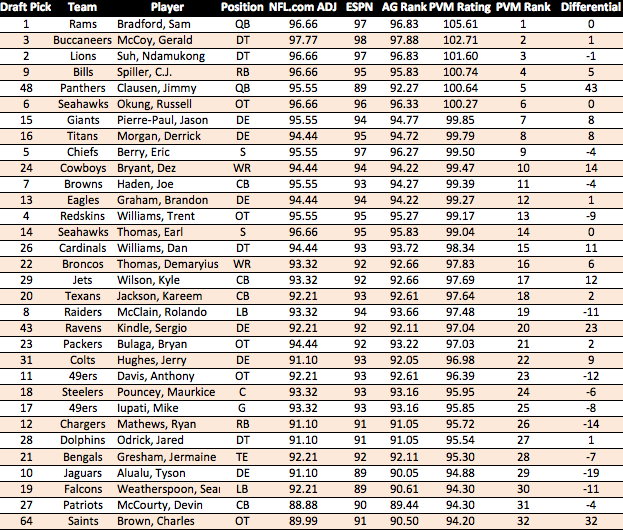 – Tyson Alualu and Tim Tebow stand out as the worst “value” picks in the first round. Tebow, even with the positional impact bump, rated as the 44th prospect (he was taken 25th). The Jaguars, picking Aluala, were derided (correctly) at the time. If I remember correctly, the Jags justified it by saying he was the best guy on their board. However, it was pretty clear at the time that they could have traded down and still got him. It’s a valuable reminder that there is a lot more to “winning the draft” than just setting your board more accurately than other teams (better scouting). As I’ve explained, the “skill” portion of the draft involves moving around so you get the guys you like at draft spots where they offer maximum value. – Nate Allen’s here as well, drafted 12 spots ahead of where the PVM ranking has him. This was a 100% “need pick” and clearly hasn’t worked out the way the Eagles hoped. – Conversely, Anthony Davis has worked out for the 49ers, despite being taken 12 spots ahead of where he was ranked. One big note here that, although obvious, I feel compelled to explain: Every team will have their own individual position values, which means each team’s PVM Board (if they made one) will look different from the one above. For that reason, it’s tough to grade teams on individual picks because we don’t know what their internal positional ratings are. It’s possible that the 49ers place a higher premium on OT than the rest of the league (likely in fact). In that scenario, their PVM board (with no regard for scouting), may have had Anthony Davis (and Iupati) ranked higher, which might justify taking both OL well ahead of their rankings above. Prior to this year’s draft, I hope to compile individual PVM ratings for each team. It will probably be very “noisy” due to various contract issues, but it also might help us infer what teams might do. Perhaps I’ll even put an “ideal” mock draft up, showing what each team should do with their picks under this system. Some BIG hits here as well as some BIG misses. – Clausen I mentioned above. Though he appears to be a miss, the idea here is that at the time of the draft, his potential upside warranted a much higher draft choice than 48 overall. That said, it’s conceivable that he has just been lost behind Cam Newton and can still be a productive player on the right team (though I’m not holding my breath). – Sean Lee and Dez Bryant both fly up the board here. Bryant ranked #10 overall by PVM. – At the bottom of that chart we can see JPP and Derrick Morgan, who both ranked as top 10 prospects by PVM. – Charles Brown jumps a full round by PVM, though it’s still unclear how his career will pan out (injured his knee this year). – Terrence Cody and Sergio Kindle both rank high, and coincidentally or not, were both selected by the Ravens. Though neither player has played up to their projections, it’s interesting to note the Ravens’ multiple selections. I’ll be keeping my eye on which teams show up more/less on the over/under-draft lists. In theory, teams that are applying a system of this type should find their way onto the under list with some frequency. That’s all for today. Hopefully we’ll have some Eagles FA news to discuss soon. Again, if anyone knows anywhere to get past prospect rankings, please let me know. I dont think an overdraft of 12 picks in the 2nd round is a problem. I mean if you look at some of the names in the underdrafted, many of them have done less than Allen. Derrick Morgan has done nothing really, same with Kindle, Cody (I mean he lost his job to a 35 old stop gap player), Clausen, Mays. Good points. I talked about Davis and Iupati, their status is likely a result of the 49ers valuing OL higher than the model does. Yes, a 12 pick difference in the 2nd round isnt a big deal. The larger point I wanted to make was that they picked Allen cause they wanted a S, not cause he was the best player on their board. Looking at Dez Bryant definitely exposes the biggest issue with developing a consensus rating for each player, since those don’t account for potential background issues. We can definitely assume that most teams dropped Dez at least a few spots because of his off-field stuff. However, there’s no way that I can think of to account for this, so it’s probably destined to be a permanent flaw. The system clearly isn’t perfect, nor is it meant to be, but remember that any system is going to “miss” on a fair amount of players, there just aren’t that many good players entering the league every year. The big “misses” here are largely the result of the scouts being way off. Kindle, for example, was very well regarded by most scouts. It’s possible that the NFL teams did a better job of scouting him than the sources I used, but Im not ready to say that yet (and I don’t think it’s true). The only way to address this is to include more ratings, but to date I’ve only found 3 for this year. That’s why I really wish I had NFP’s ratings for last year, since they seem to be more willing to stand on there own (see Ryan Nassib #1 this year). That’s got a LOT of value for this type of system. Dez Bryant raises an interesting question: how do teams quantify an inherently qualitative trait (behavioral concerns). If Dez graded out top 10, how do teams justify passing on him in terms of their “big board.” Only potential quantitative indicator I can think of is the Wonderlick score, but obviously that opens up a huge can of worms. Has anyone examined the distribution between Wonderlick scores and subsequent character issues? Seems like a potential relationship could exist (but no scout/gm would ever admit to it). I think in all likelihood, teams don’t even attempt to quantify that. It’s probably somewhat binary. Some teams will red flag the guy and not draft him regardless, while others are willing to take the risk and may not alter their ranking at all. great question though, id love to hear an answer from an ex-front office rep. Regarding the Wonderlic, ill look into it, but my understanding was that the results are secret, so any reported scores are potentially unreliable. Just a note regarding the need thing from Tommy from igglesblitz. He said its normal when GMs stack there boards that they start out with stacking it purely based on grade and then begin to shuffle it around based on need (if you are set at RB like we are a position with higher need like safety will jump a RB) and positional value (so an OT with a lesser grade might jump a guard), ofcourse there has to be a limit to how much need and positional value (which are also scheme and team dependent) triumphs pure BPA. agree 100%. Teams will obviously shift the board based on need, the question is how much to move things around. The ideal draft strategy, in my opinion, would be to set a default draft board like the one I have provided, and then decide what your needs are. If you need a CB, for example, you should trade down until the best guy available is a CB. Hard to do that perfectly, for obvious reasons, but thats the theory. At the very least, you can get close by trading around. Also remember that just picking a player to fill a need doesn’t guarantee you anything. If you reach for a player to fill a need, you are taking someone with lower odds of success. Take another look at the historical draft success odds. In my mind, I’d rather grab the best talent early in the draft, then throw lots of picks at the needs late in the draft. For example, I’d have no problem drafting 4 LBs in the same draft, provided you are trading down and adding picks to do that. I think that gives you a better chance of success than just taking 1 LB in the 2nd round and assuming he’ll work out. That’s a topic I want to address in a separate post though, but something to think about. I missed it before, but regarding Derrick Morgan: he ranked as the 4th best 4-3 DE last year according to PFF. While B-Graham ranked 2nd, Morgan did it with twice as many snaps.